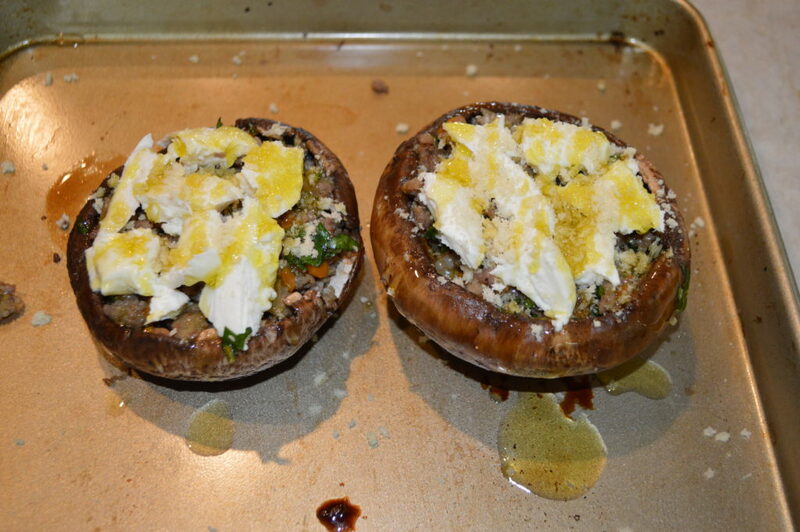 Stuffed portobello mushrooms make the best gourmet weeknight meal. 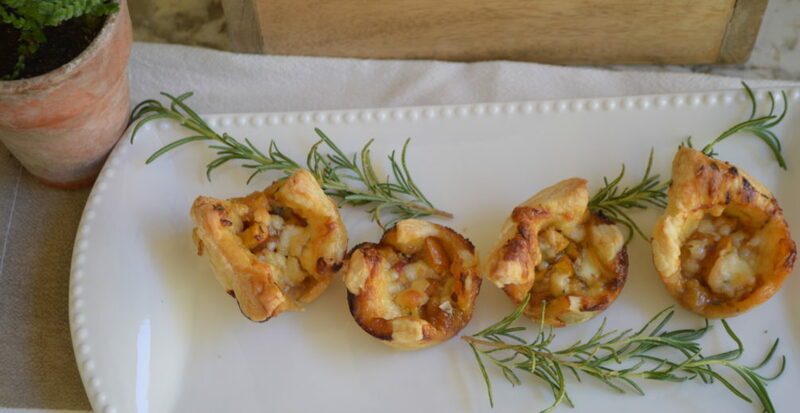 Perfect for date night or even a casual evening with friends because the presentation is elegant but really the flavors are something everyone is familiar with. I mean who doesn’t love a cream cheese and sausage stuffed mushroom as an appetizer at any cocktail party, right? So why not take the same idea and make it into a meal? But even better because it’s a little lighter without all that cream cheese and with a touch of veggie. And tastier, in my humble opinion, because you get more flavor by using a large portobello mushroom cap that has a lot of earthy and meaty flavors to it. If you are a mushroom lover than this is really for you. No little itty-bitty mushroom that has more sausage than mushroom going on. Not that there’s anything wrong with that….just sayin’. 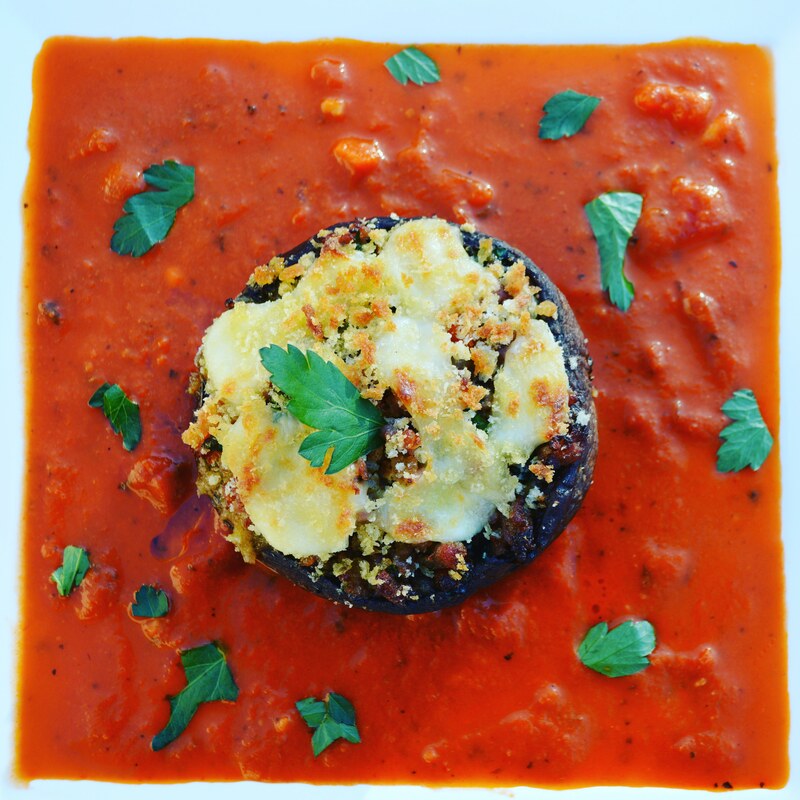 This dish leads with the mushroom and lets the other flavors act as the backdrop. Even the meat…. I used a country pork sausage (no spice to it) for the stuffing and sauteed that up with some onions and garlic and orange bell pepper. But don’t feel like you need to do the exact same. 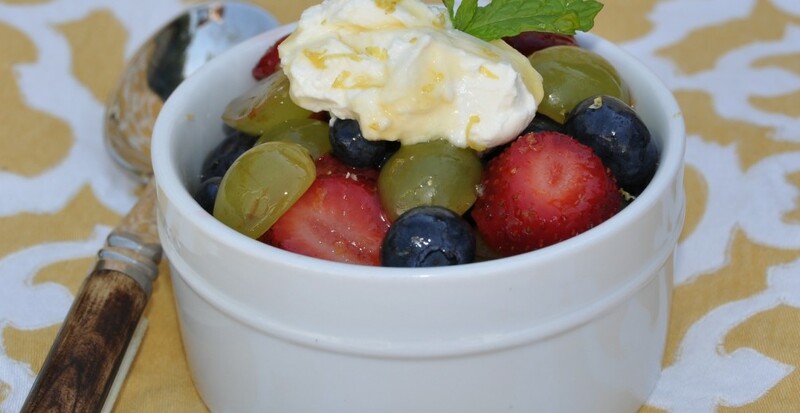 Just take the proportions and the steps to make this from my recipe and change it up however you like. You can use ground beef instead, or omit the bell pepper and put in chopped celery. 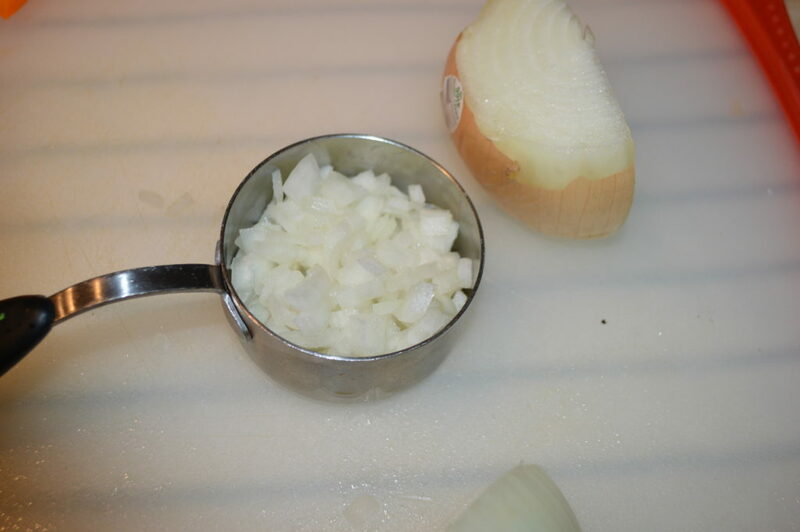 Or instead of yellow onion you can do leeks! And if you like spicy then by all means use a spicy Italian sausage instead of a country pork sausage. As always, just use the best quality ingredients you can find and the rest will take care of itself. We almost…. 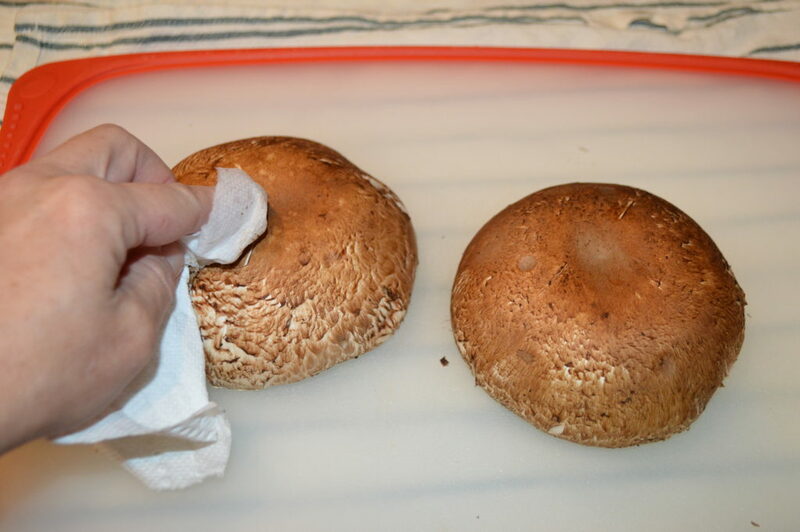 Using a damp paper towel wipe any dirt or grit from the outside of the mushroom cap. Next we want to marinate the mushrooms to give them a little boost of flavor when they bake. If you plan ahead I would leave them marinating in the fridge for up to 4 hours, not longer. 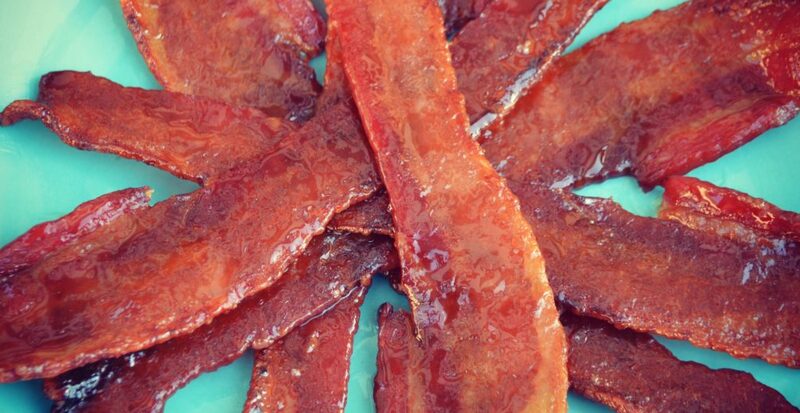 If you don’t have time for that then just gently toss them with a little olive oil and balsamic vinegar and season with salt and pepper and move right on to the next step. I like to use a resealable plastic bag or a shallow baking dish. Just be gentle so you don’t break the mushroom. Drizzle in a few tablespoons of olive oil. Then a little good quality balsamic vinegar. (I found an aged one at Costco that I really like because it’s already thick and syrupy). 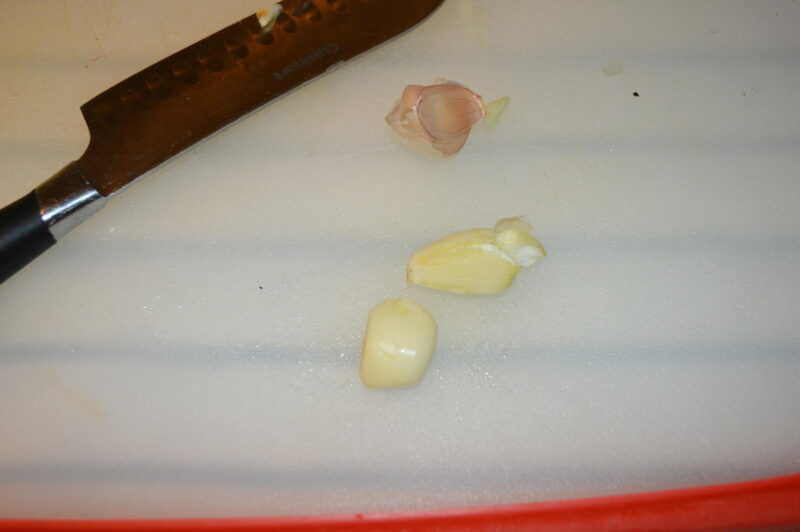 Then season with a good pinch of salt and pepper and seal and put in the fridge for 30 minutes or up to 4 hours. 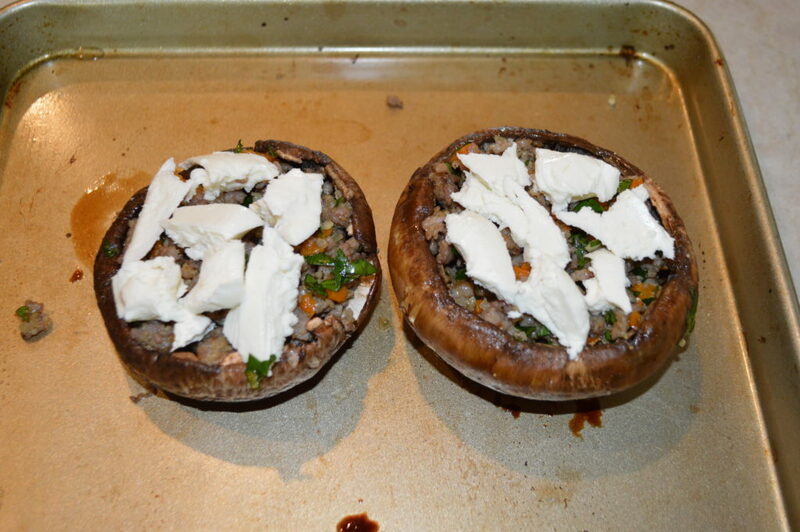 Next step is to make that yummy filling for the mushroom. 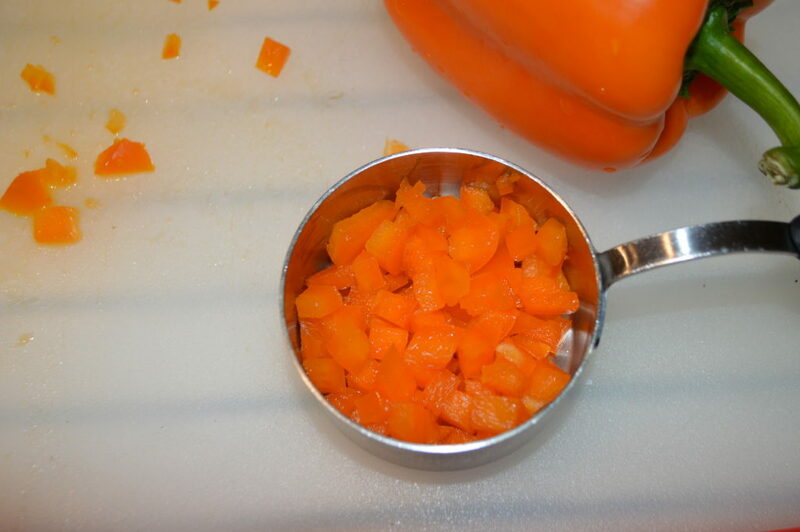 Start by dicing your veggies…. 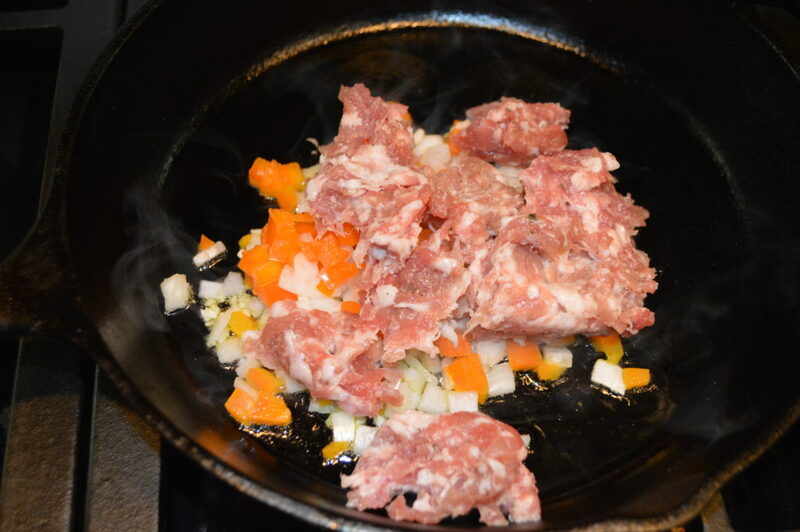 Then the pork…and start to crumble it up into pieces with a wooden spoon so you get an even mixture. Cook until the pork is browned and fully cooked through. Then remove from the heat and add in about 2 Tablespoons of fresh chopped parsley. Set aside. Or refrigerate the filling until read to use if making ahead. It’s time to pull it all together and stuff the mushroom and bake it. You can even do this step ahead and refrigerate until ready to bake which makes this a really nice make-ahead meal, too. Start by preheating the oven to 375 and grabbing a sheet pan or oven proof baking dish. 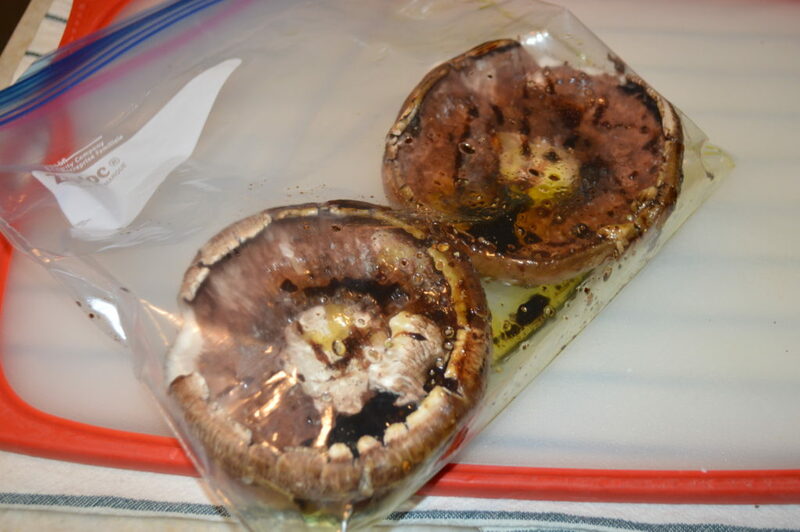 Remove the mushrooms from the marinade and toss out the marinade or reserve for another use. Place the caps on the pan and grab your pork and veggie mixture. You can’t see in the picture but you want to add little layer of sauce to the bottom of the mushroom before you add the meat. It gives the mixture some moisture when baking so it doesn’t dry out. 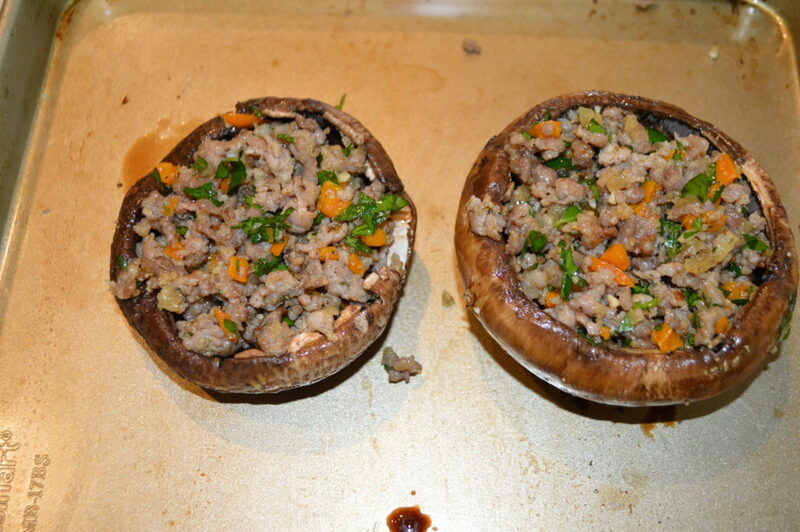 Then just spread the meat mixture evenly between the two mushrooms. For the sake of food blogging and photography I didn’t add as much cheese as I really wanted to. But for real life….pile it on. Completely cover the meat with fresh mozzarella. I just tore mine into pieces and placed on top. It’s all going to melt so it doesn’t have to look pretty going into the oven. Then sprinkle on a few breadcrumbs. I used Panko (the larger Japanese style breadcrumbs) but you can use whatever you have on hand. And if you don’t have any don’t sweat it. This step is optional. 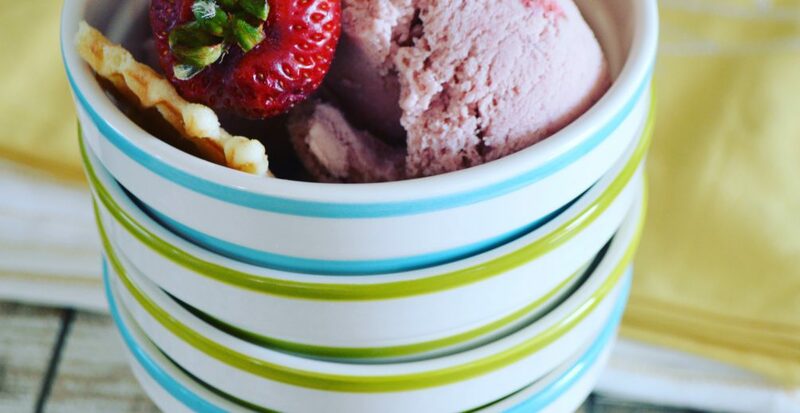 I like the contrast in texture with a little bit of crunch in there but it’s not a deal breaker. I’d eat them anyway. Bake for 22-25 minutes or until golden brown on top and the cheese is fully melted. I placed mine under the broiler for a few seconds right before serving to make sure the top was browned. 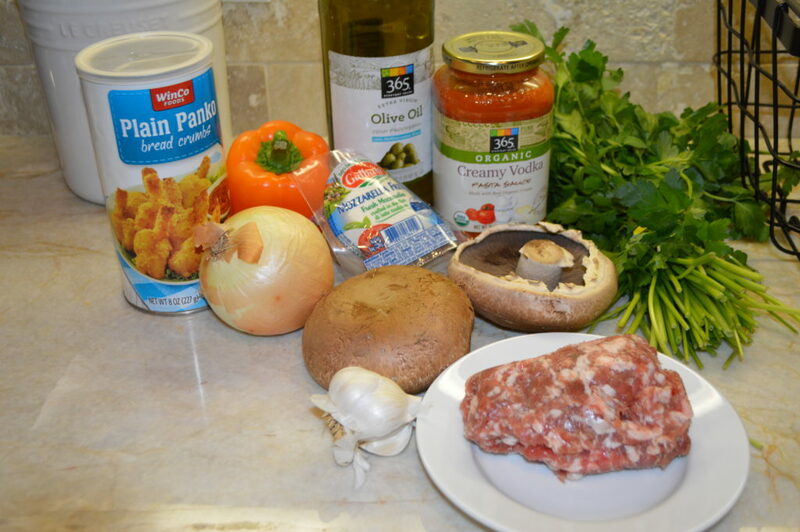 While the mushrooms are baking is when you want to heat up the marinara sauce you are using so it’s hot when the mushrooms come out and you are ready to plate! To plate you can scoop some sauce down on the plate and top with the mushroom and a little more fresh chopped parsley. This is a more elegant presentation. Or, if you are going family style, I would just scoop that sauce right over the mushrooms and serve that way. Up to you! 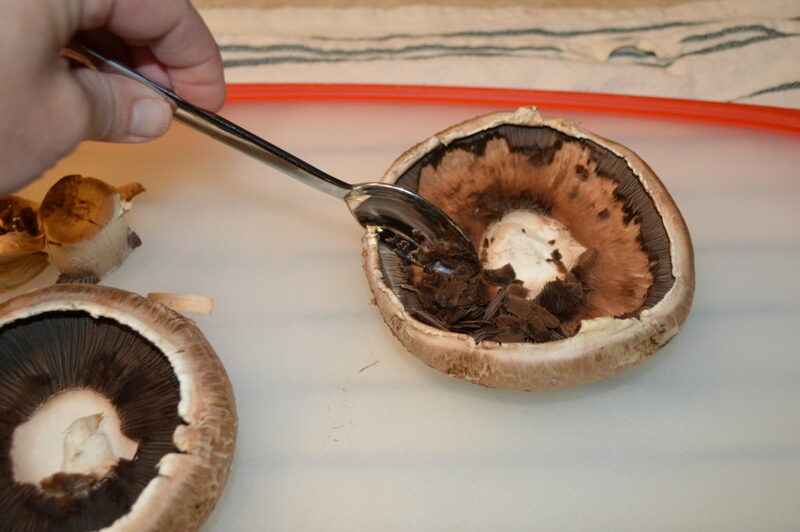 Clean the mushrooms with a damp paper towel and gently scoop out the gills with a teaspoon. 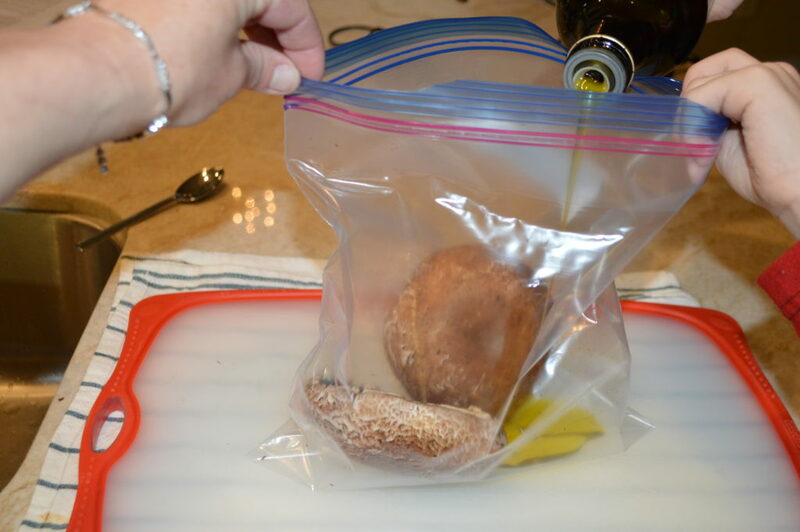 Place mushrooms in a shallow dish or resealable bag and add in 3 Tablespoons olive oil, balsamic vinegar and season with salt and pepper. 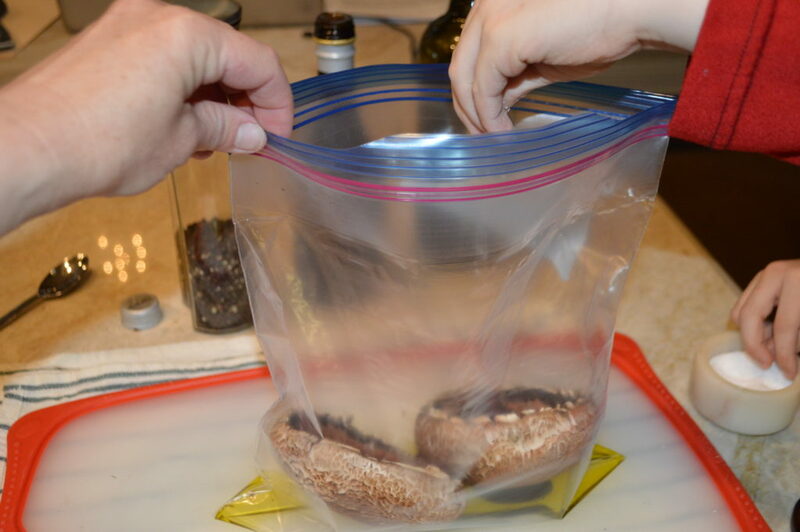 Seal bag and refrigerate for up to 4 hours. 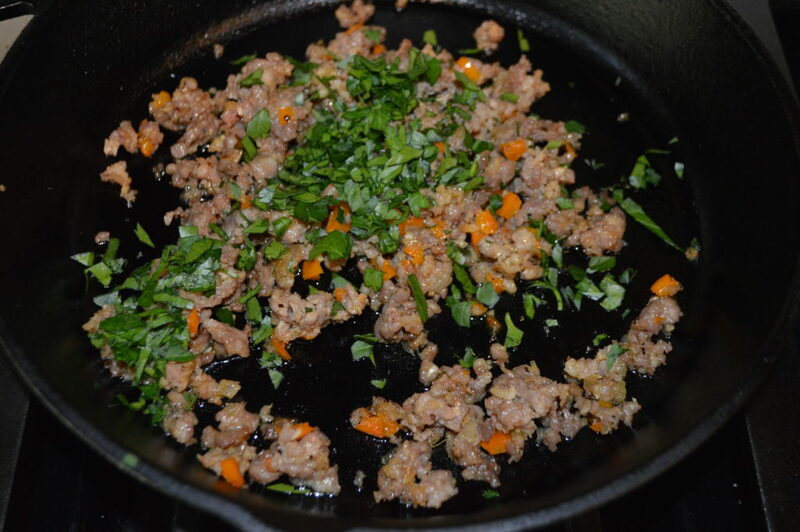 Make the sausage stuffing by heating a saute pan over medium high heat and adding a little oil to the pan. When hot add the veggies and then the meat and season with salt and pepper. Cook until the sausage browned and completely cooked through. Remove from heat and add in fresh chopped parsley. 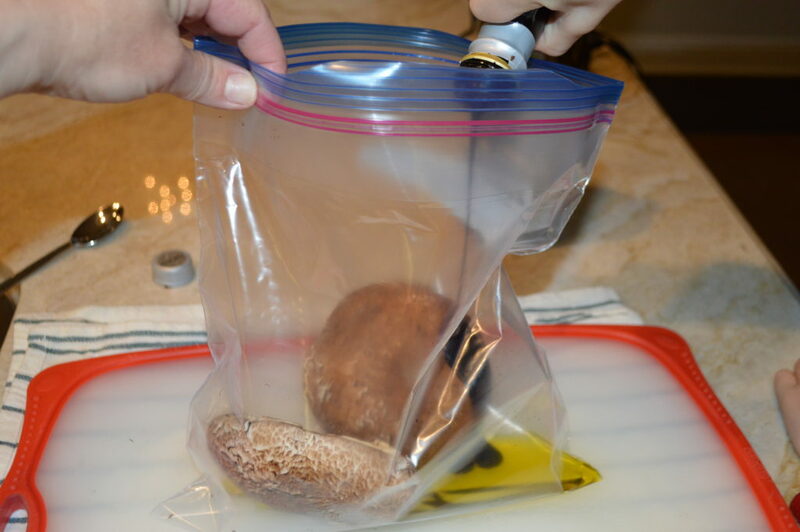 Set aside or refrigerate until ready to stuff the mushrooms. 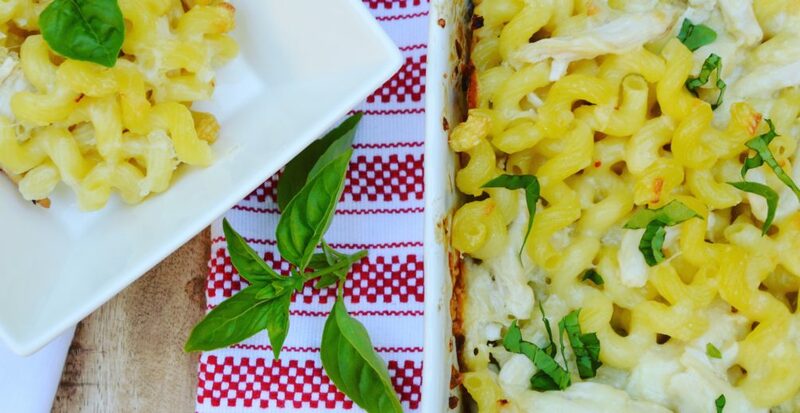 Preheat the oven to 375 and grab a sheet pan or baking dish. 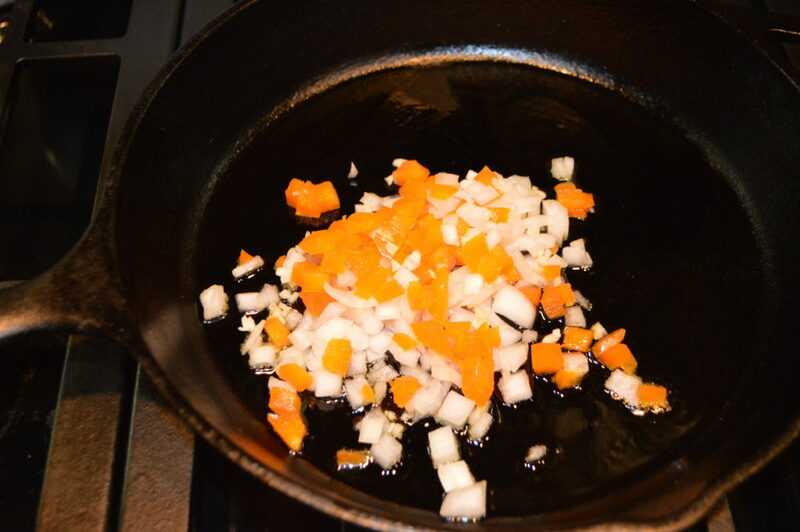 Remove the mushrooms from the marinade mixture and place on the pan. Add a little bit of marinara sauce to the base of each mushroom and then evenly distribute the meat mixture into each mushroom. Top with mozzarella, breadcrumbs and drizzle with a little olive oil. Bake for 20-25 minutes or until cheese is melted. To serve: Heat marinara sauce. 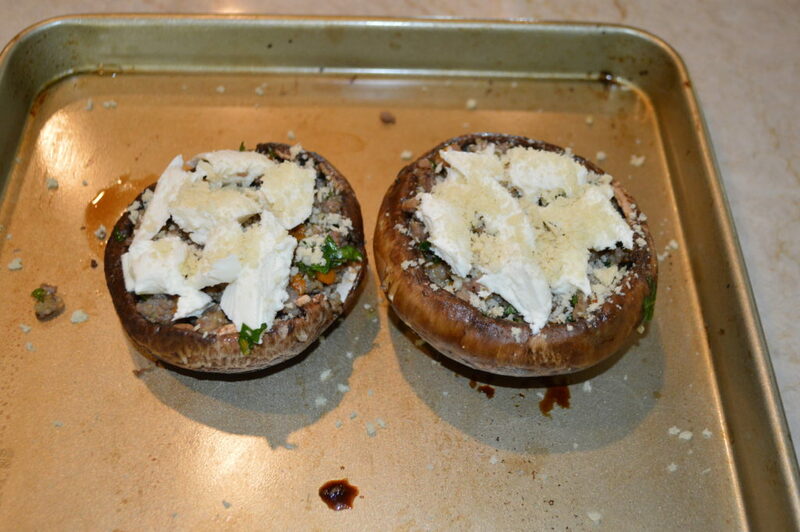 Place mushrooms under the broiler if desired to get final golden brown on top. Scoop sauce on plate and top with mushrooms and more flat leaf parsley. I gotta say that was amazing! !